In the middle of the fortress stands the most impressive and visible of all the structures – Peter and Paul’s Cathedral. 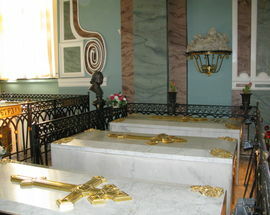 This is the burial place of all of the Russian Emperors from Peter the Great to Nicholas the Second. The Cathedral became the first one of the city that was built out of stone, and was built from 1712 to 1733. 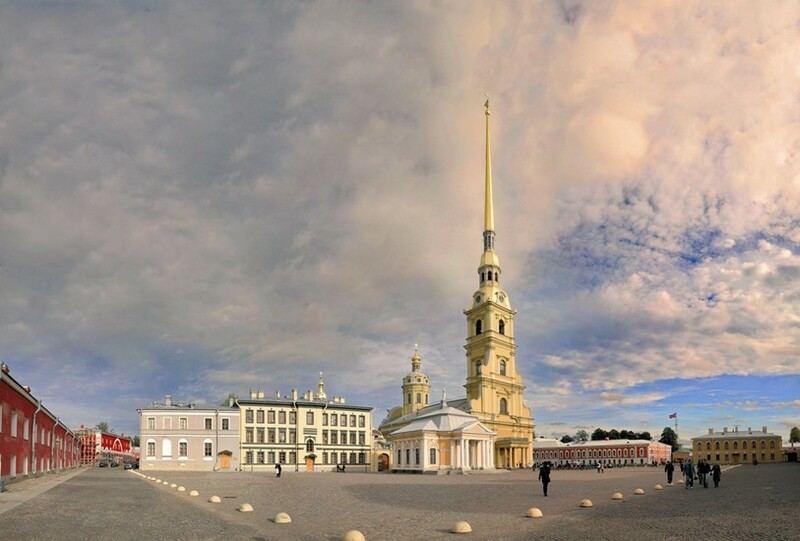 Previously, from the year of the foundation of the city of St. Petersburg in 1703, a wooden church stood on the island in honour of the holy apostles Peter and Paul. On top of the Cathedral is a gilded spire, and on the peak is a figure of a flying angel holding a cross. 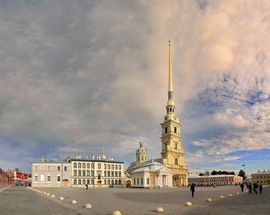 This is one of the main symbols of St. Petersburg and is the tallest building in the city with a height of 122.5 metres. The spire is visible from quite far away locations around the city. The interior of the cathedral reminds one of the inside of a palace and is completely authentic and pristinely preserved. 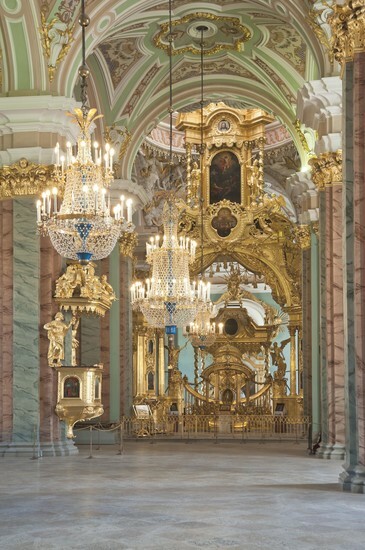 Inside you will find antique paintings and icons, carved iconoclasts in the form of a triumphal arc and an altar canopy, in front of which is situated a magnificent gilded chair adorned with two statues of the apostles Peter and Paul. The royal seat is carved and decorated with gold and crimson velvet. Several of the valuables of the Cathedral were lost after the revolution of 1917. The church has never held such ceremonies as a baptism or a wedding – only the funeral rites and burial services of of the dead of the Imperial family, or of the commanders of the fortress. In 1896, next to the cathedral, another location was built, the Grand Ducal Shrine. From 1908 to 1915, 13 members of the Imperial Family were buried in the Crypt, including 8 graves moved from the Cathedral. 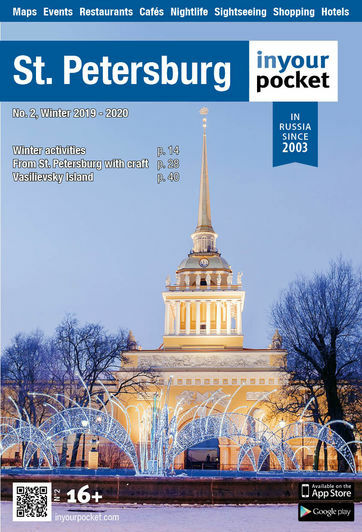 In the summer of 1998, on the 80th anniversary of the execution of the last Tsar, Nicholas the 2nd, and his family, their remains were laid to rest here. 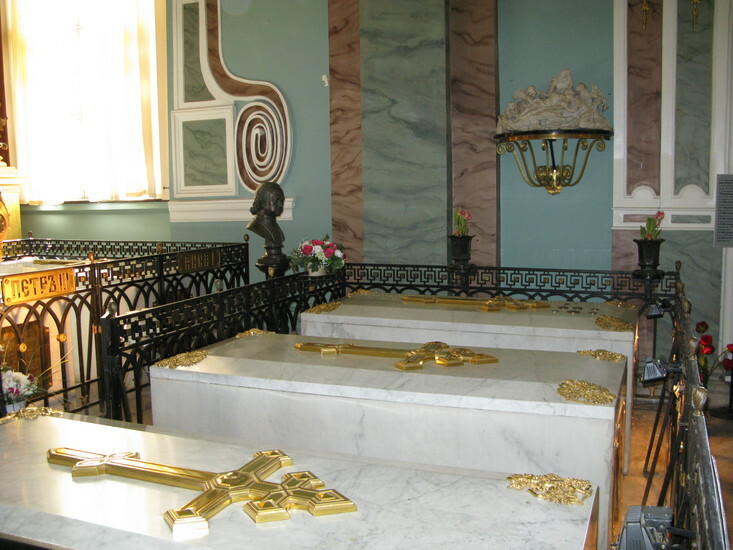 In September 2006, the remains of Maria Fyodorovna were reburied next to the grave of her husband, Alexander III. Open 10:00 - 18:00, Tue 10:00 - 17:00, Sun 11:00 - 18:00. Closed Wed. 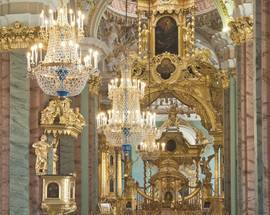 Working hours of the Peter and Paul Cathedral can change on the days when church services are held.